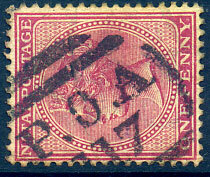 (Type 2) on KE7 1d (SG.128). on QV ½d (SG.97a), perf. faults. 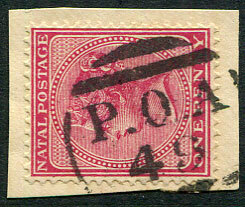 (Type 2) on QV 1d (SG.99a). 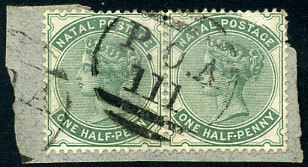 on QV 1d (SG.99a), crease. on part horiz. 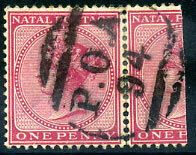 pair QV 1d (SG.99a). on KE7 1d (SG.148), minor fault. on QV 1d CA wmk (SG.99a). 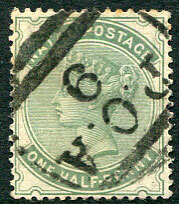 on QV 1d CA wmk (SG.99a), some toning. on horiz. 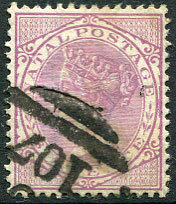 pair QV ½d (SG.97a) piece, left stamp with downward tear at top. on QV 1d (SG.99a), toning. on horiz. 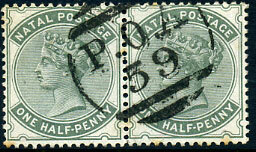 pair QV ½d (SG.97), perf. toning.